Well day 1 of round 2 is in the books. It was another very long day and we needed to pause the treatment at one point for about 25 minutes because I developed an alergic reaction to the Rituxan. This exercise is more the rule than the exception with me but after a brief hiatus and some additional Benedryl, I was able to resume and conclude the treatment. My blood counts looked OK at my pre treatment check in with my doc. Since starting treatment, my WBC has gone from 40,000 to 20,000 to now 5,000. Reds and platelets are starting to dip but are still in the safe range. However, once today’s meds take hold, I will likely plummet so we will keep a close eye on everything and give me red and white boosters when needed as we try to shrink a boatload of lymph nodes. I had a couple of rough patches today but all in all felt good. I had the support of my wife, daughter, and sister with me. And our other daughter phoned in her love during treatment as she was stuck at work. I’m optimistic about the treatments but realistic in knowing that I am going to feel pretty beat up in the next few months. But this is a small price to pay for the long range remission that’s expected from this protocol. 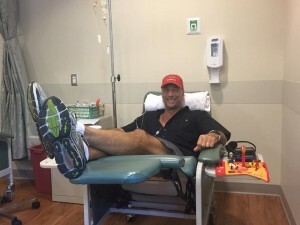 This entry was posted in cancer, health & fitness, motivation, survivor and tagged bendeka, chronic lymphocytic leukemia, cll, crozer keystone, rituxan. Bookmark the permalink. Both comments and trackbacks are currently closed.